I found this old school photograph again recently and thought that it might make some of you smile – if you can recognise yourselves that is. Now that’s not bad, considering that with the exception of Jean Peel, I have not seen any of them for fifty seven years! So can anyone identify themselves – or anyone else here? Click on the photo for a larger image version. Hello Barry, I just noticed your surname and wondered if there might be a connection. My Mum’s Mum was Lottie Jane Plank and she had several brothers. Their parents were William and Lottie ( Mum’s Mum was named after her). Hi Tracy, I’m afraid the date was a rough guess, I was born in 1946, must have started there at the age of five, so 1951. Was certainly still there in 1953 at the Coronation, but we moved to Woodingdean at some point shortly after that, before returning to Hollingdean. Feel free to add the names to your photograph. Regards Barry. Hi Tracey & Barry, I have the same photo shown above & it was me that provided it some time ago to the Hertford Road for their archives. I also feel pretty sure the year I gave of 1954 was correct, which would have made me 7 years old. In 1951 I would only have been 4, & none of the children here look that young! I can’t recall a Barry Plank, but can list a lot of those pictured here. Front, L-R, William White, Christopher?,Robin Campbell, Peter Medhurst, Philip Morgan, John Sussex, Roger Townsend, Alan Burton, Geoffrey Steel. Next row, can only remember Jean Peel, Maureen White, Linda Verrion, Joan Payne, Sandra Crouch, Gillian Dorman. Next, Michael Hickman, Peter Braddick, David Cowstick, Michael Wilson, -, John Eastwood, Terry Gray, -,-, Charles Parks, Maurice Bowles. Next, Deidre Hancock, Shirley Challen, -,-, Derek Wolvern, Anne Chapman, Malcolm Jeffries. Back row – Jean ?, Graham Childs, Me, David Funell, Philip Ward. Maybe someone else can fill in the blanks! 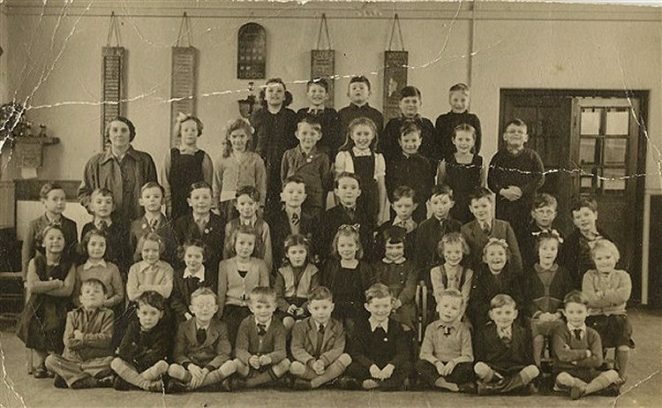 Message for Barry Plank – it was lovely to see your school photo of Miss Budd’s class in ’52. She was my great auntie Dolly. I would love a copy of that picture if possible, for my family history folder. Kind regards Irene Dobson (nee Budd).